Something interesting is happening at Sally Loo’s Wholesome Café. Maybe you’ve strolled through the railroad district on a recent weekend night and heard—much to your delight—the sounds of thumping bass and jangly guitar spilling into the street. Maybe you’ve seen flashes of life-sized art pieces crafted by Neal Breton being hauled in and out of the venue’s ancient double doorways. HOT DOG! : During a recent happening at Sally Loo’s, organic artisanal chili dogs collided with Americana music and cold craft beer. Maybe you’ve even seen Sally Loo herself—the gentle gray pitbull that is the establishment’s stately figurehead—hanging out on the sidewalk greeting customers way past the cafe’s normal hours (even the dog’s got a mischievous gleam in her eye). What the heck is happening at Sally Loo’s? Let me paint a picture: On a balmy evening last month, local country group Shawn Clark and the Family Band performed to a packed crowd inside the café while friends noshed on special grass-fed organic beef “Carolina chili dogs” topped with local Los Osos Organic Farms cabbage slaw and raw cheddar. Kids bit into colorful hunks of watermelon, juiciness dribbling down their happy chins. 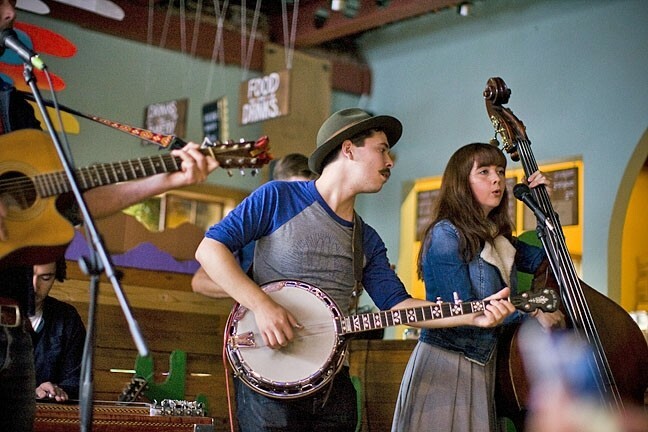 Locals of all walks of life shared cold craft brews between dances to the Americana twang. Behind the band, Breton’s vivid, life-sized desert-scape beamed with perky cacti and graphic, multi-colored sunset. The scene was a far cry from the usual morning clatter of breakfasters chatting over pasture-raised eggs and Four Barrel Coffee. Welcome to Sally Loos’ new themed nights, bolstered by a shiny new beer and wine license and a hefty dose of wild, artistic, scrappy spirit. These “happenings” are erupting on select weekend nights only, spanning everything from prosecco popsicles paired with live surf punk to a forthcoming vegan poutine night, slated for Sept. 30, where patrons will be encouraged to don Canadian tuxedos (that’s head-to-toe denim, in case you’re wondering). But these events are about more than the buzz of alcohol or the kitschy-cool pairing of cheeky art and artisanal food. It’s about something harder to put your finger on: the vibe that emerges when you mix up a bunch of artists, foodies, musicians, and farmers—and give them a place to experiment. When I catch up with the busy mother of two, she’s putting together yet another art collaboration with Breton to be hung on Sally Loo’s walls. A cluster of silver-dollar-sized illustrations emblazoned with the names of family farms (Templeton Hills Beef, Morro Creek Ranch) are ready to pin onto a California-shaped corkboard hanging to the right of the whirring barista station. GATHERING PALS: Locals chill out, dance, and watch little kids frolic about the dance floor at a recent happening combining art, music, and food at Sally Loo’s Wholesome Cafe. Manuele admits that it’s sort of a “twisted business model,” providing local, seasonal, high quality ingredients priced far lower than a fancy farm-to-table restaurant. Frankly, she doesn’t give a damn. That’s probably why folks have come to expect the best bread, the best cheese, and the best produce from Sally Loo’s, whether it be an early morning muffin or a leisurely brunch hangout with friends on the side patio. Needless to say, I was surprised to find that the café’s original offerings didn’t include food. The Manueles opened Sally Loo’s seven years ago with a simple dream: to serve really good coffee to their friends. Now, the café is known for that—plus hefty, artisanal portions of creative comfort food, farm-fresh ingredients, and to-die-for baked goods (including vegan and gluten free offerings). But back in the early days, it was a whole different story. That just wouldn’t do. If Manuele is one thing, she is hospitable and warm—the kind of hostess that always asks, first and foremost, if you’re hungry or parched (she just won’t take no for an answer). So, when the couple retrofitted the building back in 2011, they built a proper kitchen, now embellished with sweet little murals. Regulars know that the big rolls of butcher paper that hang from the walls are always full of changing breakfast and lunch specials. One week, you might see beet, cucumber, dill gazpacho, and the next the appearance of a “belly bowl” brimming with rainbow quinoa, seasonal zucchini, spinach, and a farm fried egg. Of course, the breakfast items are famous for the amount of love (ahem—real butter) found in them. Take their buttermilk waffles with bacon, bruleed bananas, pecans, and whipped cream. A HAPPENING SPOT: Plenty of new Sally Loo’s happenings are in the works, including a British high tea complete with all the proper fixings; educational events featuring local winemakers, cidermakers, and breweries; additional creative themed nights with the art of Neal Breton; and more. Check the cafe’s Facebook page for upcoming events or go to sallylooswholesomecafe.com. The cafe is located at 1804 Osos St., and hours are 6:30 a.m. to 3:30 p.m. Monday through Sunday, with select evening weekend happenings continuing through 2016. A Canadian-themed happening is slated for Sept. 30. Everything is made from scratch, including the crunchy daily made granola that tops their now famous acai bowls. Note: Indeed, Sally Loo’s goblets did mark the superfood’s first appearance in SLO (the couple brought the idea back from a trips to Santa Cruz and Hawaii). By 2013, that mix of imagination and local freshness had quickly transformed the coffee shop into a bustling breakfast stop and local hangout. In the midst of this popularity, the couple’s first child, Frances, was born. Six months ago, little Arlo came into the world. As of now, the restaurant closes at 3:30 p.m. to accommodate “the little people,” as Manuele lovingly calls them. At the recent Shawn Clark concert, Manuele served bottles of beer and local Jean Marie Cider with little Arlo on her hip. “Our managers and our core crew have kept us going in the most beautiful way possible; the café never paused, but Brandon and I were able to,” Manuele says of her strong, loyal, and dedicated team. It’s obvous that, for this big, boisterous extended family, good food and the good life are totally interconnected. The fun that comes with added art and music is an extra cherry on top. Basically: Once a friend of Sally Loo’s, always a friend of Sally Loo’s. Consider this swinging cafe your new enigmatic buddy that’s always putting on the best parties. Hayley Thomas believes in the road less traveled at hthomas@newtimesslo.com.